Rajya Sabha today saw sparks flying after BJP leader Subramanian Swamy dragged Sonia Gandhi’s name in the AgustaWestland VVIP helicopter bribery case, triggering angry protests by Congress. At one point, there seemed to be a possibility of an ugly showdown as some Congress members menacingly rushed towards the treasury benches, prompting a couple of marshals to step in to act as a wall. Congress members, calling Swamy a “CIA agent”, created bedlam, forcing repeated adjournments of the House in the pre-lunch session. However, Chairman Hamid Ansari prevailed on the agitating members to take up the Question Hour. Swamy, a BJP leader who took oath only yesterday as a new member nominated by the government, raked up the issue of AgustaWestland chopper case through his first Zero Hour intervention soon after the House met for the day. He cited allegations reportedly made by Christian Michel, the controversial middleman in the Rs 3600 crore VVIP chopper deal, through a letter to the High Court of Italy. As soon as Swamy named Gandhi, Congress members angrily stormed into the Well, with a handful even moving closer to the treasury benches menacingly. Members of the treasury benches too got up on their seats to counter the opposition. Fearing an ugly showdown, a couple of marshals stepped into the Well to act as a wall between the opposition and the ruling side. Deputy Chairman P J Kurien immediately adjourned the House for 10 minutes lest the situation went out of hand. reference to Gandhi saying he should not name a member who cannot come and defend himself or herself. Gandhi is a member of the Lok Sabha. “I am not admonishing you as this is your first speech in the House. 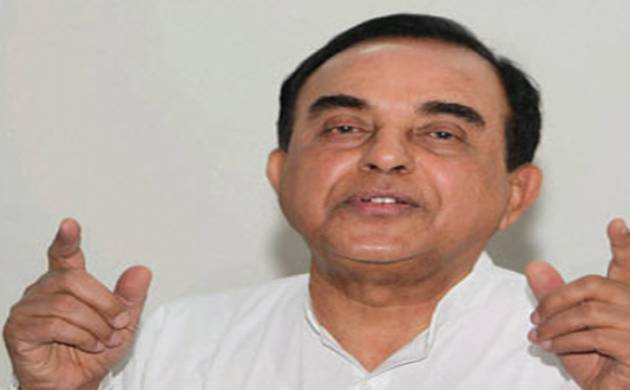 But the name is expunged,” Kurien told Swamy. This did not satisfy the Congress members who were in the Well again shouting slogans against Swamy. Leader of Opposition Ghulam Nabi Azad, citing some media reports, alleged that Prime Minister Narendra Modi had met his Italian counterpart and struck a “deal” to free two Italian marines, facing charges of killing to Indian fishermen, in exchange of information on Gandhi family in the chopper deal. Finance Minister and Leader of the House Arun Jaitley rejected the charge, dubbing it as “false and untrue in entirety”.”No such meeting at all has been held,” he asserted. He said the principal issue is that there was allegation of bribe being paid to secure the defence deal. “The bribe-giver has been convicted and now bribe-taker has to be identified,” Jaitley said. Earlier, Azad asked the government if the Prime Minister had during a meeting with his Italian counterpart in September last year offered to free the Italian marines. “Pronouncement of judgement (on the chopper deal) has come and now NDA government is now allowing Italian marines to return home. So the deal is struck,” he alleged.